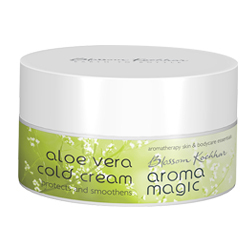 Buy Aroma Magic Aloe Vera Cold Cream Improve Hydration & Elasticity, Smoothens, Moisture & Protects. Transform dull, dry skin to make it lively and attractive. 100 % free of petrochemicals, phthalates, toxic ingredients, artificial colouring and fragrances. The goodness of aloe vera extract makes me a multi benefit cold cream and your skin?s best friend. Transform dull, dry skin to make it lively and attractive. Extracts of cucumber and apple combine to improve hydration and elasticity. Lemon essential oil seals in the moisture and protects. The lavender essential oil delights your senses with a delicate fragrance.